TV Week Logie Award nominees will be announced on Monday. This year the announcements will take place at a nominations party at Crown on Monday afternoon. In recent years the nominees have been revealed in various guises, at Sydney-based events designed for either breakfast television, or the Sunday evening news. They have also been announced in the magazine hard-copy on Monday mornings. There’s still a fair bit we don’t know about this year’s Awards: who will host, who is getting Hall of Fame and could it ever go Live to air to avoid those pesky leaks? Last year Bauer Media ruled out any future embargos releases for media, to avoid repeat performances. And which of last year’s Gold nominees will make the list this year? To remind you, they were: Carrie Bickmore, Hamish Blake, Adam Hills, Asher Keddie, Andy Lee and Steve Peacocke. What new names do you think we will add this year? TV Tonight will be bringing you all the nominee info on Monday afternoon, but you can safely expect a room full of people to be tweeting on it simultaneously too. TV Week Logie Awards air on Nine, Sunday April 27th. Asher would be a shew in for the gold. 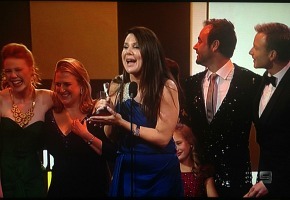 She won it last year and obviously had a bigger storyline in the last season of Offspring. I hope to see Marta Dusseldorp nominated at least in the best actress. I’d say Asher Keddie is a shoe in for a gold nomination, wouldn’t be surprised to see Matthew LeNevez in the mix either. The home and away representative may be missing as a lot of key cast members will split the vote. Be great to see Edwina Bartholmew nominated as she has had an extremely strong year. Charlotte Dawson (before her tragic passing) had quite a present social media campaign so wouldn’t be shocked to see her up there either. Nominations aside, there better be a host this year! The last 2 years ceremonies have been disastrous without a host, so they need someone to hold it together. A comedian like Wil Anderson, Shane Bourne or Julia Morris would be perfect. Dare I say it even Karl and Lisa would be more tolerable than no host! good to see them having a proper Nomination Announcement event. It adds a little buss to the awards. However, I read in this weeks Tv Week mag that next weeks mag, they will announce some nominations with the rest announced throughout the day. Id say minor awards will be in the mag? Would’ve liked to find out the nominees in the morning. Hoping Neighbours will be nominated but they probably won’t be.